Egyptian, Saite Period, 26th Dynasty, ca. 664 to 525 BCE. 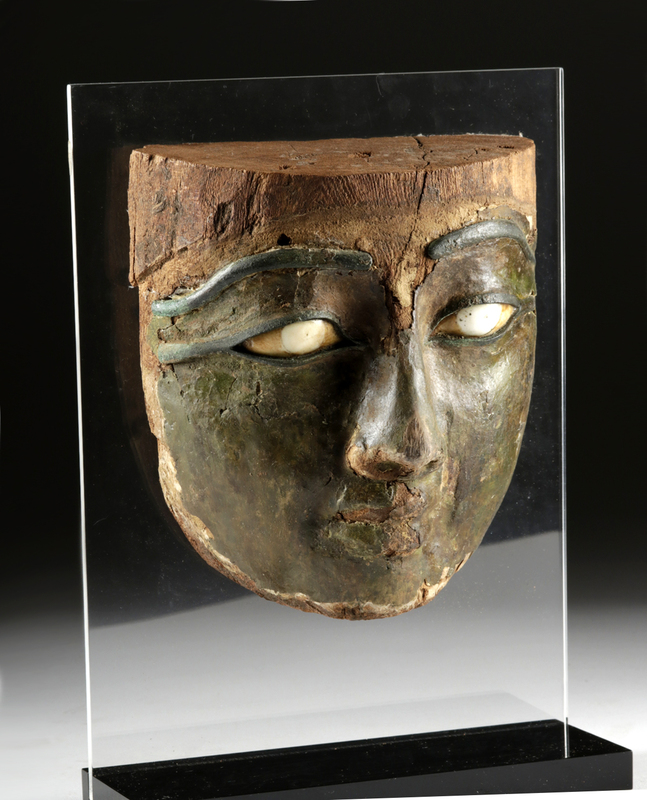 A dramatic sarcophagus mask carved from cedar (or possibly sycamore) wood and presenting a mesmerizing visage comprised of bewitching stone eye inlays - with the irises delineated in a whiter color (possibly once painted with a vegetable-derived pigment) and the sclera more golden - bronze inlaid eyebrows and eyeliners that have oxidized to beautiful blue-green hues, full closed lips, a straight noble nose, and elegant contours, all on a painted gesso (cartonnage that employs plaster and linen over wood) face of sage green hues perhaps intended to represent bronze. Finely carved and skillfully decorated with pigmented gesso as well as bronze and stone inlays - a very special example. Size: 6.25" W x 7.25" H (15.9 cm x 18.4 cm); 10.625" H (27 cm) on included custom stand. Ancient Egyptians believed it was of the utmost importance to preserve a body of the deceased, because the soul needed a place to reside after the death. Preservation of the body was done via mummification - a process involving the removal of internal organs that were placed in canopic jars, wrapping body in linen, and then embalming. 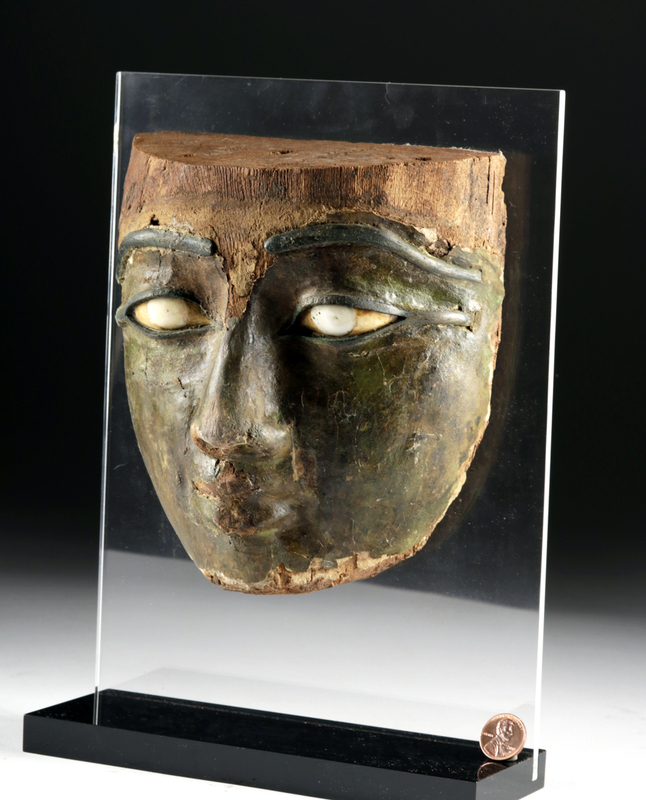 Death masks like this example were created so that the soul could recognize the body and return to it. For this reason, death masks were made in the likeness of the deceased. Artisans used different materials. Earlier masks were carved from wood. Later, cartonnage, a material made from papyrus or linen and soaked in plaster which was then applied to a wooden mold, was used. Royal death masks, perhaps the most famous being that of Tutankhamen, were made from precious metals. All death masks were intended to resemble the deceased subject; however, eyes were always slightly enlarged and lips presented in a subtle smile as we see in this example. Condition: Overall excellent with some minor consolidation. 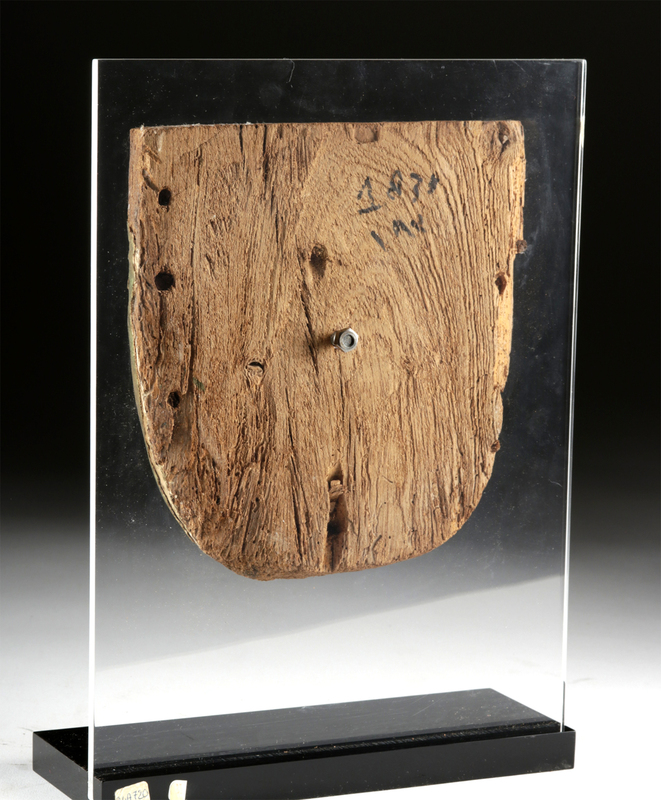 Expected surface wear commensurate with age with losses to gesso on upper section of head, nose, lips, chin, and peripheries and age cracks and losses to areas of the wood as shown - but overall the surface is strong and stable. Still much of the painted gesso detailing remains as do sections of dowels in drilled hoes for former attachment to mummy. Stone and bronze inlays are in nice condition. 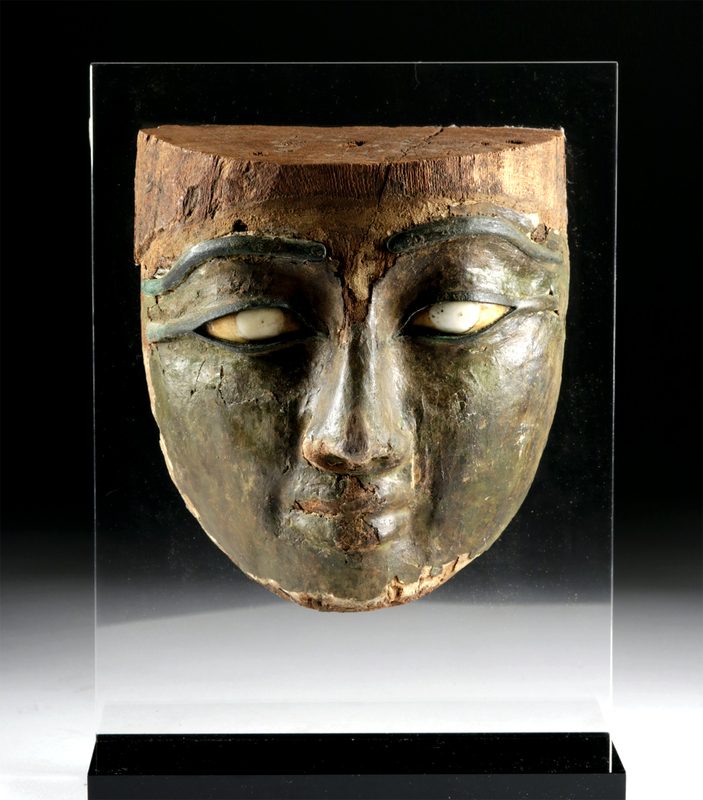 Bronze has developed an attractive blue-green patina over the ages. Areas of mineral deposits on visage as well. Collection numbers in black on the verso. Attached to lucite stand with a single screw to the back center.